PUBG is a mobile multiplayer game that has been a rage among players this year. It even has a dedicated e-tournament for gamers. A Tamil Nadu college is on the warpath against PUBG - a fresh 'addiction' that has gripped young mobile users this season. 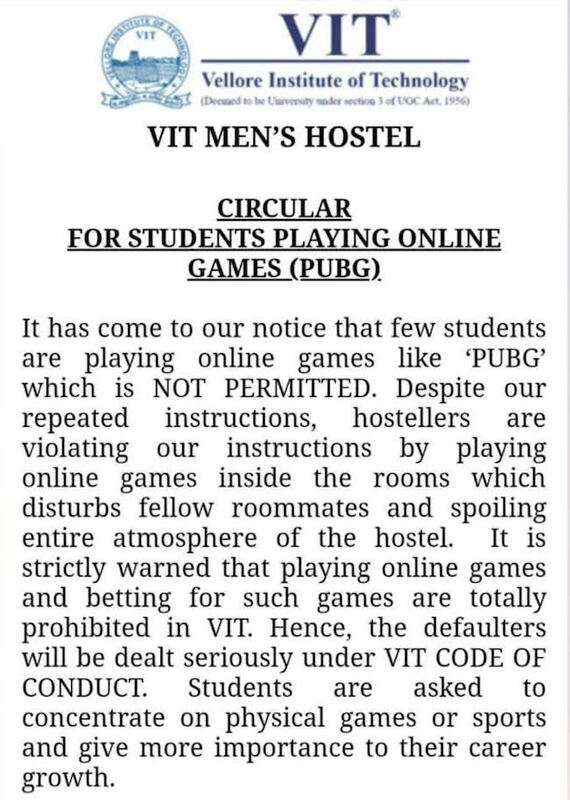 On Monday, the Chief of Warden of VIT's (Vellore Institute of Technology) men's hostel fired a stern e-mail to all boys, warning them to quit late night online games, especially PUBG. "It has come to our notice that few students are playing online games like 'PUBG' which is NOT PERMITTED. Despite our repeated instructions by playing online games inside the rooms which disturbs fellow roommates and spoiling entire atmosphere of the hostel. It is strictly warned that playing online games and betting for such games are totally prohibited in VIT. Hence, the defaulters will be dealt seriously under VIT CODE OF CONDUCT. Students are asked to concentrate on physical games or sports and give more importance to their career growth," the circular read. Confirming the news, Deputy Director of hostels in VIT said that the varsity did not want its students sitting in their rooms all day and night playing PUBG. "We received complaints that PUBG addiction among certain boys in the hostel has been causing disturbance and ruining the hostel atmosphere. We don't want our students to sit in their rooms all day and night on their phones. We want to encourage outdoor activities. Addiction to such games also results in poor academic performance by students," he said. However, contrary to the circular's warning that 'strict action would be taken' against defaulters, the hostel authorities said that students found playing would only be advised and let off. "We are just trying to advise the students. We won't take any strict action against them. We have a code of conduct for students and strict action will only be taken if they violate this," he said. PUBG or Player Unknowns Battle Ground is as an online multiplayer game for consoles last year. It belongs to battle royale genre and shot into immense popularity soon after it hit the market. In March 2018, the mobile version of the game was launched on Android and iOS devices and has been dominating the charts for the majority of the year. The phone version known as PUBG mobile basically has 100 players dropping in on a map where they find weapons to fight. They then use this eliminate other players till they are the last one standing. The game reportedly even has a dedicated e-sports tournament that draws professional gamers to the platform. The game gained notoriety after several cases of PUBG addiction were reported in Bengaluru NIMHANS (National Institute of Mental Health and Neuro Sciences). Reports also state that several schools in the city have advising kids of the ill-effects of playing the game for hours at a stretch.